Polytech Grenoble : Le blog – Page 7 – Toute l'actualité de l'école, vue par les élèves ! Déjà 29 articles en ligne sur le blog depuis son lancement en septembre ! Et ce n’est pas prêt de s’arrêter, 2019 nous réserve bien des surprises… Mais avant cela, tout comme vous, on va prendre quelques vacances bien méritées ! L’ensemble de l’équipe du blog de Polytech Grenoble vous souhaite de passer de merveilleuses fêtes de fin d’année avec ceux que vous aimez ! How to make a success of your Christmas presents? Christmas is fast approaching and you still have not done your Christmas shopping? Everyone knows that finding gifts is not always easy. But do not panic ! This article will give you tips to find for sure the ideal gifts. First, do not absolutely look for the element of surprise. Of course surprises are always a pleasure, but they can also be very bad! So do not hesitate to ask the person concerned what they want for Christmas, at least you are sure to hit the nail on the head. Unfortunately it is not always so simple since there is a 90% chance that the person answers you « oh that’s nice of you but I have no idea what I want ». And in the remaining 10%, there are those who want an off-budget gift. That’s why you should not hesitate to make a group gift! Because if you thought you were the only one without ideas, think again. It is therefore very easy to make a beautiful gift even with a tight budget when several people participate. If you’re still out of ideas, think about the person. What are his hobbies? What does he need? What does he NOT need? And do not forget to focus on quality over quantity. Indeed, a big package under the tree is always making dream but when its content is disappointing, it’s worse than anything. As far as I’m concerned, I prefer gifts that last in time, those that make me think of the person who gave them to me everytime I see them. So do not bet on the ephemeral gifts, it would be a pity that nobody remembers your gift (even if chocolates are always a pleasure). Another tip would be to avoid decoration gifts. We do not all have the same tastes, it’s cumbersome and it’s likely to end up in a closet. In addition, it will prevent you from attending a (bad) acting performance of a person who claims to adore his gift. Finally do not forget to talk about your gift to the one who receives it when offering it. Without epiloguing either, explain to him why you made him this gift, and why to him particularly. This will allow him to see the importance you give him and therefore to appreciate the gift even more. 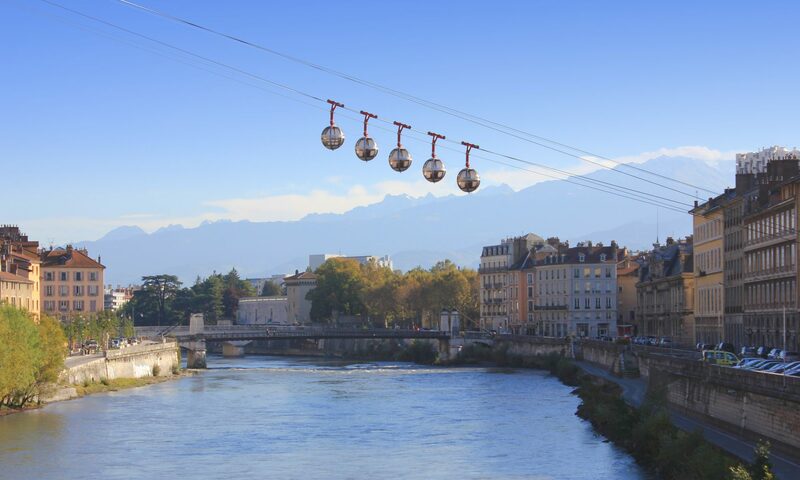 From November 28 to December 30, the traditionnal Christmas Market takes place in the streets of Grenoble, especially in the Victor Hugo and Grenette squares. The market is composed of more than a hundred of mountains chalets, where you can find craftsmen or even restaurateurs who present and sell us regional products, and lots of other products related to Christmas. You can savour a good mulled wine or a hot chocolate for the youngest, taste gingerbread or a famous and delicious raclette sandwich. It is also the best place to find gift ideas for your loved ones! Not far from the place Victor Hugo, in the Square of Doctor Martin, you will also find exhibitors’ chalets : these chalets form the Market of Social and Solidarity Economy. « Deuxième Acte » : a stand dedicated to the reuse of used objects. « Le Bistrot de la Mixture » will give you the opportunity of savouring a « Truffade du Vercors » along with a delicious Christmas beer ! The Grinch is a story in a fictional down called Whoville, where christmas is the most important time of year for all, exept for the the grinch who can’t stand it at all. The grinch who is portrayed by Benedict Cumberbatch,a well known actor, for his recent rolls in Marvel movies or the popular TV series Sherlock. He is accompanied thoughout the film by his trusty companion a dog called Max. The story we follow is of 2 people, the Grinch of course and a little girl who is determined to meet Santa. We can see 3 acts in the movie, the first being the introduction to our characters and their motives for the rest of the movie, the Grinch being to ruin christmas and the girl’s to meet Santa. The second act is the preparation and planning, with some comedic moments so as to not loose us. And the third act is them carrying out their plans and the conclusion to our story. At first glance this movie seems to be a fun and upbeat, but it has an important message that can easaly be missed. Throughout the fil the Grinch is portrayed as a mischevous anoyance who seems to want to see people sad. But if you pay attention when they talk about his origins it tells the story of how loneliness and solitude can be a terrible thing. Indeed, the Grinch was an orphan who was neglected at christmas while he saw over children having fun and playing with their parents. They also mention emotional eating for laughs but it is a real problem for some people suffering from some of these things. However, the film does not try to forcibly teach you this, if you want to go and watch it just for the fun and to have a laugh you can, but after seing it and thinking about it this is what I also saw. So if it tickles your fancy this film came out on the 28th of november and you can see it at the Pathé at Chavant. Personally I would recommend it just for how cute Max is. Make your own Christmas tree ! 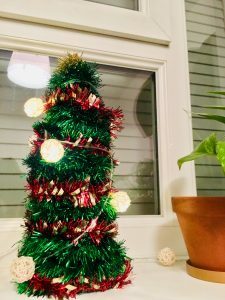 A DIY student Christmas tree ! Don’t have enough money to buy yourself a Christmas tree ? Or is your room too little to welcome one ? Worry not, because you can make one yourself with very little spending. First, buy yourself some green tinsel and a bottle of sparkling water (notice the triangular shape). Then, unscrew the cap and put the end of the tinsel inside of it. You can now start wrapping the tinsel around the bottle until you reach the bottom. Once you’ve finished, stick the other end of the tinsel on the side of the bottle with some tape or glue. Ta-dah ! You’ve now built your own Christmas tree ! You can even decorate it with other colored tinsel or a light garland if you feel like it. If you made one yourself, don’t hesitate to share a picture with us in the comments below !